PFLP marks the ninth anniversary of the assassination of Comrade Leader Abu Ali Mustafa with pledge to resist negotiations. The Popular Front for the Liberation of Palestine marked on August 27, 2010 the ninth anniversary of the assassination of its leader General Secretary Abu Ali Mustafa by an Israeli occupation rocket in 2001. 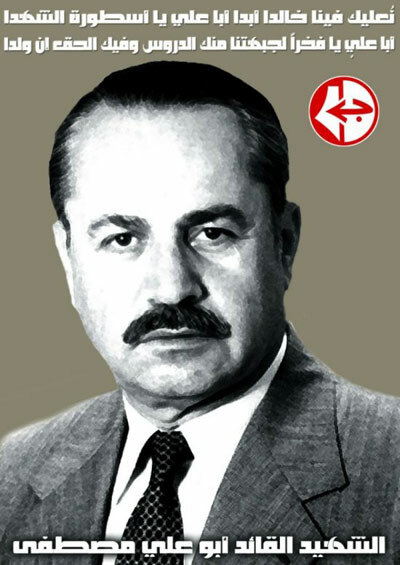 As the Palestinian people confront a new round of threats to their national cause and national existence, the legacy of Comrade Abu Ali Mustafa remains always, in his words, a legacy of “resistance, not compromise.” PFLP organizations throughout occupied Palestine marked this anniversary with a deep commitment to resist the new round of “direct negotiations” and to uphold Palestinian national rights, particularly the right to return, and Palestinian national unity, and carry forward the commitment of Comrade Abu Ali Mustafa in a new era of struggle. Comrade Abdel-Rahim Mallouh, Deputy General Secretary of the PFLP, said at a ceremony at Comrade Abu Ali Mustafa’s tomb in El-Bireh that the Front will pledge to continue its march along his path of resistance and total commitment to Palestinian national liberation, stressing that today’s fight to end the dangerous direct negotiations is necessary to continue the struggle against the entire edifice of the Oslo process. In Gaza City, Comrade Kayed el-Ghoul, member of the Central Committee of the PFLP, emphasized that the Front is firmly committed to achieving Abu Ali Mustafa’s goals of national liberation and national unity, and actively plans to initiate collective efforts in the West Bank, Gaza and outside Palestine to confront any form of compromise of Palestinian fundamental rights, particularly the right to return and the right to self-determination. He condemned the Ramallah Palestinian Authority’s suppression of actions against the negotiations and warned that these were a mechanism to support U.S. hegemony in the region while providing a cover for Israeli occupation and settlements. 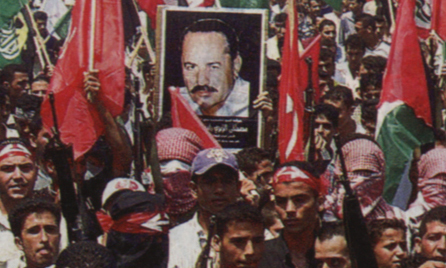 In Jabalya, Comrade Ramiz Abu Ruksha spoke about Abu Ali Mustafa’s firm commitment to Palestinian resistance, and saying that his blood was not shed in vain, saluting the heroic PFLP fighters who assassinated Rehavam Ze’evi, the notoriously racist Zionism tourism minister, on October 17, 2001, in response to the killing of Abu Ali Mustafa. He said that their action ensured that the Zionist regime learned that the blood of Palestinian martyrs is precious, and that assassinating Palestinian leaders should bear a consequence for the assassins. The PFLP in Jenin held a mass rally in Arraba, Abu Ali Mustafa’s hometown, attended by over 2500 people. Comrade Abdul Nasser Abu Aziz, member of the Central Committee of the PFLP, delivered the speech on behalf of the Front, saluting the prisoners of the Palestinian people, in particular Comrade Ahmad Sa’adat, the General Secretary of the PFLP, and demanding their freedom. He emphasized the Front’s unequivocal rejection of all negotiations with the occupation state. Comrade Dr. Hani Mustafa Zibri, Abu Ali Mustafa’s son, presented a recorded speech on behalf of the family of Abu Ali Mustafa, saying that the commemoration of his father’s martyrdom only emphasized that the Palestinian love of life and freedom would never be murdered by the Zionist enemy. He traced his life and history, from his involvement with the Arab Nationalist Movement, through the founding of the PFLP, and his experience in the Palestinian Arab struggle in West Bank, Jordan, Syria, Lebanon and Ramallah, where he became a martyr in the land of Palestine. He emphasized that the development of a unified national Palestinian resistance was always at the top of Abu Ali’s priorities, in confrontation with the Zionist enemy. He denounced the negotiations to take place in Washington, saying that Abu Ali Mustafa represented all of our people not represented in Washington – those driven out by occupation and settlements, the millions of Palestinians in diaspora and exile struggling to return home, the prisoners in Israeli jails who are the heroes of the revolution. He saluted Abu Ali Mustafa among the constellation of heroes and martyrs, Ghassan Kanafani, Wadie Haddad, Abu Jihad, Sheikh Ahmed Yassin, Abdel-Aziz Rantissi, Fathi Shikaki and thousands of martyrs, and pledged that their sacrifice will not die on the altar of futile and dangerous negotiations in Washington DC, pledging that the Palestinian people would fulfill the goals of their martyrs and struggle until the prisoners are free, the refugees return, and all of Palestine, from the river to the sea, is free. This entry was posted in Israel, Palestine and tagged Abu Ali Mustafa, Armed Struggle, Fight Back!, martyrs, peace process, Popular Front for the Liberation of Palestine. Bookmark the permalink.